Castle' Class 4-6-0 locomotive, No.4094. A collection of brass number plates at Swindon 'works'. Locomotive workshop at Old Oak Common, London, 1959. 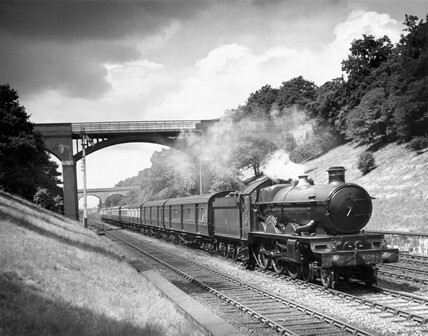 A 'West of England' express at Battledown Flyover, 1946. The 'Royal Scot', c 1930. Hall' Class 4-6-0 locomotive, No.4917. Olver Bulleid's Q1 Class 0-6-0 locomotive, built during WWII to very austere specifications.